Even from a distance the majestic importance of Evora is apparent, its cathedral dominating the view of the famous white and yellow city as it stands atop a hill surrounded by the vast expanses of the Alentejan plain in southeast Portugal. 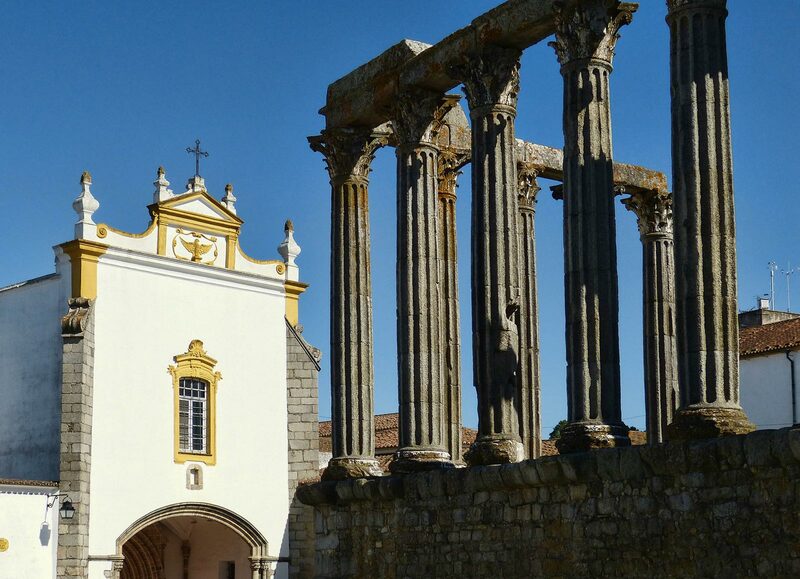 With over two thousand years of history and, therefore, a variety of cultural and architectural influences, Evora is a real national treasure and certainly merits its status as a UNESCO world heritage site. The presence of the Moors can still be felt in the narrow maze of streets which wend their way around the centre, but which often lead to large, light squares which denote other eras. Its first city walls date from the 1st century BC when the Evora, then Liberalitas Jullia, first found itself under Roman rule. During this time the city became increasingly important in Iberia, occasioning the erection of many impressive buildings and monuments a fair number of which have remains that survive to this day. The Corinthian-like imperial temple, with its twelve granite columns, believed to have been dedicated to Diana the Goddess of the hunt, dates from the 2nd century AD and vestiges of the Roman walls can be found between the palaces of the Dukes of Cadaval and Counts of Basto. Under the present day town hall are also found the remains of Roman baths. Many of these links to the distant past in Evora are kept on display through glass viewing panels to the various discovered ruins or indeed the ongoing excavations. The Visigoth era between the 5th and 8th centuries left few notable traces but the ensuing Moorish rule had much influence, including the establishing of the town’s present name: under the Muslims it became Yeborah. Arches typical of the Moors still exist throughout the old labyrinthine quarters of the city. Geraldo Sempavor (Gerald the Fearless) was the Christian knight who overthrew the Moors in 1166 and so started the golden age of Evora. Under Christian rule, the city developed a dynamic status in the Kingdom of Portugal, housing the court of several kings throughout the Middle Ages. In this period, not only did it grow in importance but also in size as numerous palaces, churches and monuments joined the already rich array of majestic buildings and even general construction began to spread beyond the original Roman boundaries. 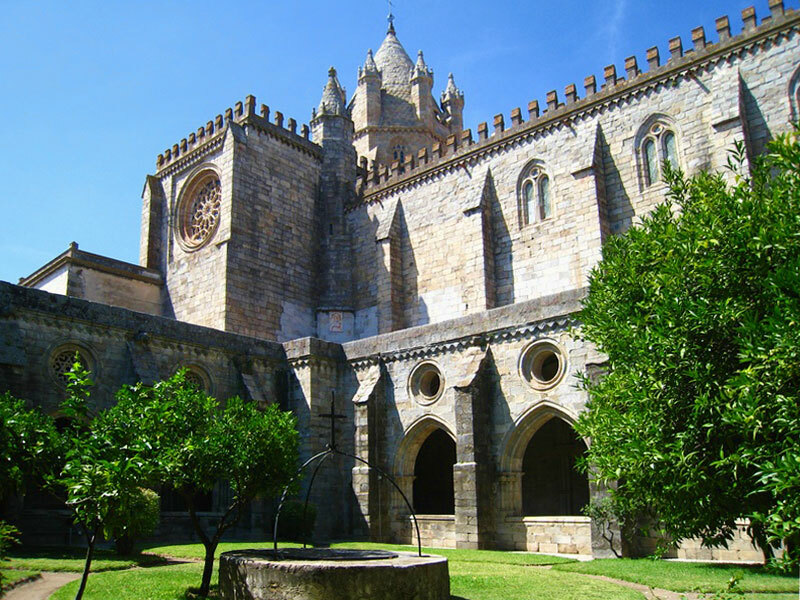 The 12th century Roman-Gothic cathedral is the largest in Portugal and houses the Sacred Art Museum. From the Largo Marques de Marialva notice the two enormous asymmetrical towers and enter the cathedral through the main door, past a band of beckoning apostles, to where you will find a quite a rarity in Portuguese churches: a stunning dome. Its 14th century granite cloisters are well kept and picturesque, as are the other riches within, such as the beautifully carved Renaissance choir stalls and the 16th century organ. 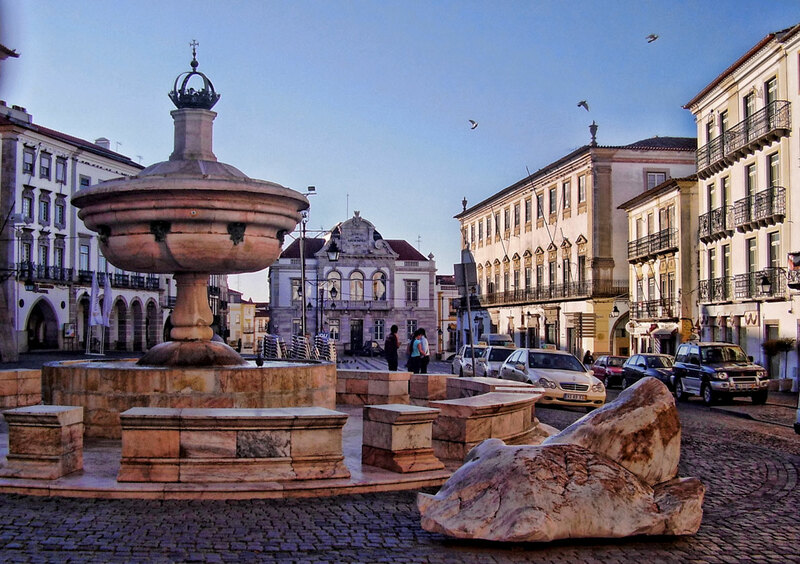 Evora is also famous for its university, the second oldest in the country after Coimbra. Founded in 1559 by the future king Dom Henrique, great masters such as Molina and Barradas shared their knowledge here and the Universidade do Espirito Santo enjoyed many prestigious years enlightening the privileged both intellectually and spiritually until the Jesuits were expelled and the doors closed in the 18th century, not to re-open until 1973. 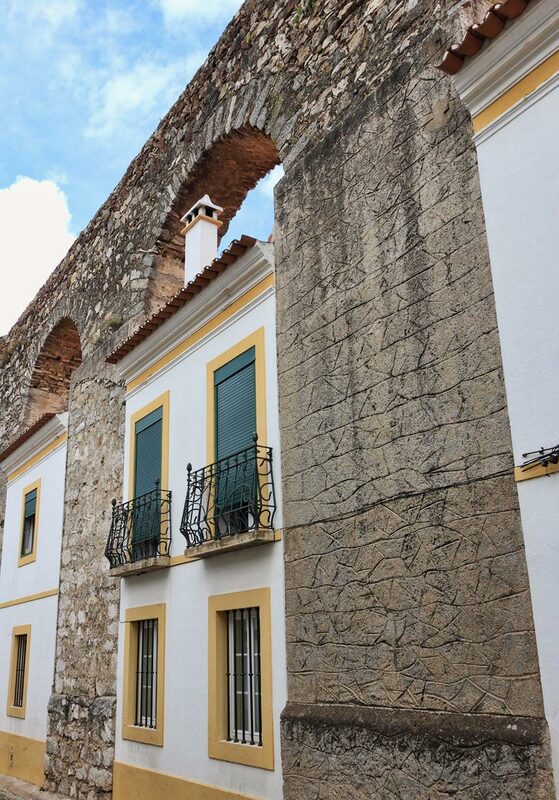 Other places of interest include the impressive 9km long aqueduct built in the 1530s, the regional museum found in one of the many aristocratic palaces and the old Jewish quarter found between the streets of Serpa Pinto and Mercadores. The surrounding area is of further archaeological interest with ancient standing stones and more than 100 dolmens, including the largest example in Portugal at Zambujeiro. 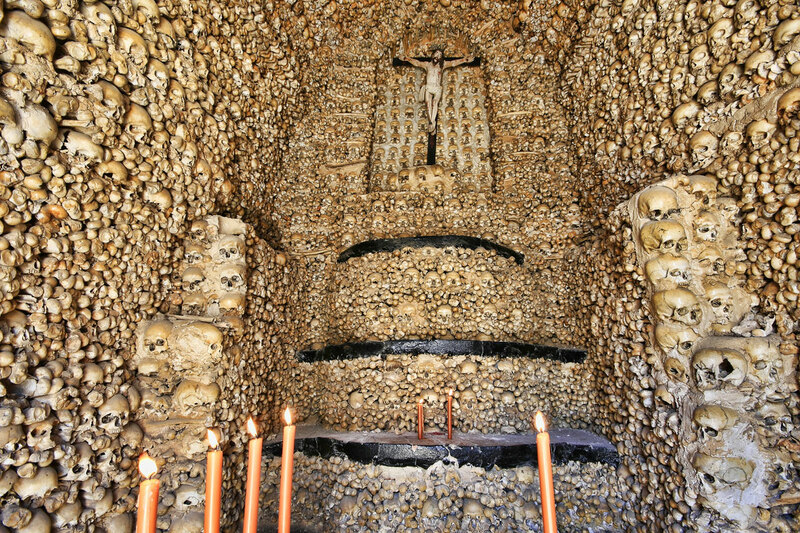 Furthermore, the cave paintings at Escoural are believed to be up to 20,000 years old.